How did you get involved in sumo? BYAMBA: In my case, my Sumo Master, the former Grand Champion, Onokuni, went to Mongolia to scout new talent for his team. After several tryouts, he offered me the chance to join his pro sumo team. As a child, I had always succeeded in Mongolian wrestling and judo, but I knew virtually nothing about Japan or about sumo either. I had always imagined that you have to be fat to do sumo, so at first, I hesitated, because I didn’t want to gain so much weight. However, one of my Mongolian friends who had sumo experience told me, “Practice is not so tough, and Japan is a lot of fun.” My Sumo Master also told me, “If you become a pro sumo wrestler, you will make a lot of money.” So, I thought I might as well give it a shot. I mean, I was given an offer as the only person chosen by the great Onokuni to join his team, so I figured going to Japan wouldn’t be a bad idea. YAMA: Oh, I see. Well, when I was in second grade, just 7 years old, I was already enormous. I believe I weighed nearly 140 pounds at that time. 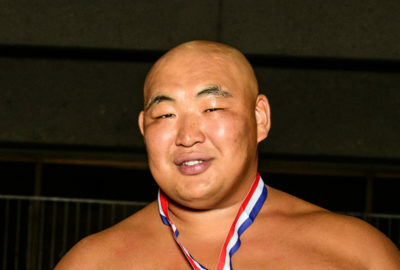 My homeroom teacher told my parents, “Your boy should really try sports!” At around the same time, the Grand Champion Chiyonofuji was retiring, so there was a lot of buzz about sumo at the time. So, I thought that I should try sumo, since I already had a good size advantage and was quite strong, too. I continued practicing as a boy. Luckily, my father had been close to the Sumo Club Director at Sakae High School (famous for it’s sumo team’s success). So, I was accepted there and started practicing even more diligently. Aside from sumo, I also had opportunities to try judo or baseball. BYAMBA: How come you didn’t try judo? YAMA: I didn’t like the idea of three-minute rounds. I also didn’t like the thought of possibly losing because of judges’ technical decisions. Unlike in judo, victory in sumo is much simpler and more clear cut. BYAMBA: So, you stuck with sumo. Was it fun for you? YAMA: Actually, I wanted to quit many times. However, at the same time, Japan was in a sumo boom. As a 4th grader, I won a regional tournament, which inspired me, but at the national level, I lost in the third round, because my sumo was not advanced enough yet. That made me feel bad, but it was also strong motivation for me to continue to improve! BYAMBA: If I recall, it was on March 5, 2001, when I took a plane from Ulaanbaatar, Mongolia to Osaka, Japan, with only $100 in my pocket, and no familiar faces with me. I arrived in Japan not knowing the language or culture, and I actually had my first taste of soba and sashimi on the airplane. To me, though, the food had no flavor at first, since Mongolians are generally not used to eating raw fish or raw meat. When I got to Osaka, it was just before the annual Osaka Tournament started, so I witnessed my very first outdoor sumo training. I thought, “What am I doing here? !” I didn’t know the language, but everyone was screaming in loud voices all throughout the practice. I felt kind of scared. They yelled as they smashed into each other, but I didn’t understand what they were doing at all. Since everyone was training so seriously, I started to doubt if I was going to be able to get to such an intense level. My Sumo Master told me to just observe at first, and that I should begin training when we got back to Tokyo after the tournament, but I felt an urgency to learn as quickly as possible. At the time, I didn’t know any Japanese, and I was somewhat frightened by the violent impacts. Still, I had some confidence in myself, since I was the Mongolian Junior Judo Champion. So, I didn’t want to wait, and convinced my coach to let me start training right away! YAMA: Well, in my case, I had been participating in sumo since I was a young boy, so I clearly knew that amateur sumo and professional sumo are on totally different levels. That’s probably because in Pro Sumo, your win / loss record has a direct and immediate impact on your finances. So, there’s much more pressure to succeed when you turn pro. BYAMBA: Definitely. I was literally thrown into Pro Sumo, with no experience in the sport. At the beginning, my Sumo Master challenged me to push him. I used all my strength against him, but he wouldn’t budge at all – not even half an inch! I thought, “What is going on? How come he isn’t moving at all? !” It was like trying to push over a mountain, or at least a gigantic boulder. While I was in awe, he laughed at me. YAMA: Yeah, apparently your Master knew the technique of staying rooted in place. Someone like that who spent decades of hard training can not be easily moved. His body became virtually “un-pushable”, one of the keys to sumo success. BYAMBA: Once my official training started, all I heard all day were “shiko” (leg lifts), “suri-ashi” (sliding the feet), and “butsukari-geiko” (hitting practice). That’s all I did at first, month after month, and year after year. At first, they made me do those drills to toughen up, and improve my conditioning and stamina. I was only 15 or so, but soon developed the powerful body of a sumo wrestler. I also remember how my hips were in constant pain at first, since I lacked flexibility. YAMA: Yep, the key to sumo movement in the hip joint. That’s one of the main factors in sumo success. All the exercises, like shiko and suriashi, involve softening the hips, for increased flexibility and mobility. BYAMBA: Yeah, “matawari” (full leg split) is also done to limber up the hips! YAMA: Yes, when I was still a student, all I did from morning to night, for the first four years were “shiko” (leg lifts), “suriashi” (sliding the feet), and “teppo” (slapping a pole). When I think back, it actually seemed harder than when I was a pro. In fact, if you don’t work on building a sumo body and good fitness as a teen, it’s going to be much harder for you later. BYAMBA: For the first couple years, I really wasn’t so good. I wondered why I wasn’t able to win. Although I lost many matches at first, as I started to develop my strength, I gradually began to win more and more, so sumo became much more fun for me! Yama: Of course, winning can be very satisfying. I think that’s the reason why I didn’t end up quitting early on. BYAMBA: People misunderstand that sumo is just charging into each other, but it’s really quite different. YAMA: That’s right. The “tachi-ai” (initial hit) is very important in sumo. Your positioning is critical, and that first second often determines the winner, based on who can get a more advantageous position. BYAMBA: Yep, it’s very important. When I have a match, I focus intensely on that point. Actually, unless you concentrate on getting better position, you won’t be able to succeed in sumo. The battle is extremely fast, so no matter what, you have to concentrate on that first split-second, to get the advantage. I really like that about sumo. YAMA: Yeah, me, too. That suits me well. That’s another reason why I chose sumo over judo. To people just starting sumo, I want to advise them: “Take the first step faster than your opponent!” Winning that opening move greatly increases your chance of winning the match. It’s truly critical. On the other hand, if you have very strong techniques, you can use various skills to escape from an unfavorable position. If you lack skills, though, even a very speedy tachiai, might not be enough. BYAMBA: Sumo matches are very short, but you must not panic. Since there is so much concentration, it’s hard not to tense up. Some wrestlers’ bodies freeze up, even before the match begins. (laughs) If that happens, you won’t be able to execute a rapid tachiai at all. The important thing is to practice a lot, to help you relax, so that your body strengthens up just at the actual moment of impact, and not before. If you are fighting in another martial art, with three- or four-minute rounds, there is plenty of time to plan and adjust, but in short sumo matches, you can only react. So, your body has to learn and memorize the proper movements. YAMA: Once you learn how to move your body as you please, sumo becomes incredibly fun. Sumo is a sport where you can not “cheat”. It’s just you vs. your opponent in a small space. You can push or just grab on to the opponent’s belt. That simplicity is another major appeal of sumo!